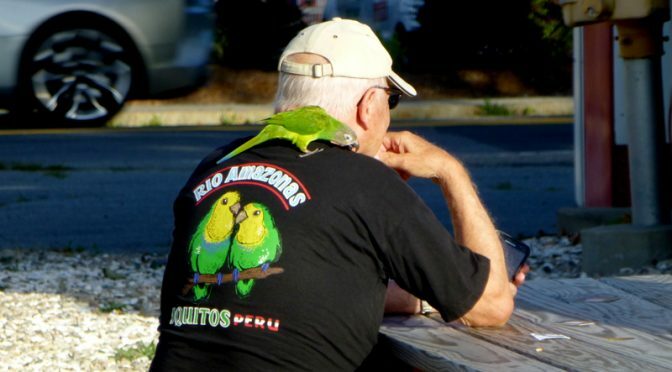 We were enjoying a guitar player and a violinist, who were quite good, at Orleans Live last week when we saw this parakeet on a man’s shoulder. It was so cute. And then, as you read the logo on the shirt, it all makes sense. Very cute, yes. I had a wonderful and smart parakeet as a pet years ago. If this is a monk parakeet and he has family, watch for the huge twig nests–colony-sized–they build on telephone poles, etc. Yes, it does look like a Monk Parakeet. Thanks!